It’s designed to lubricate, protect and at the same time enhances the look of your bike. Cleans all types of foam and fabric air filters effectively . Rhino Goo foam air filter cleaner is aBiodegradable and non-combustible cleaner for all foam and fabric air filter elements , just wash in you sink without the worry of damaging the planet . We believe that protecting the environment is of the utmost importance. 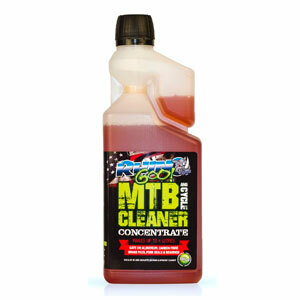 We include an empty 1 litre high quality spray bottle for you to use with the mixed bike cleaner and a small 250ml bottle to use the product neat. 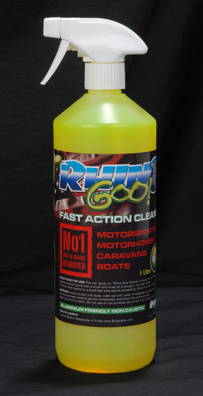 Rhino Goo Black Streak & Algae Cleaner is specially formulated for Caravans & Motorhomes and gives you 50 litres of cleaning product. 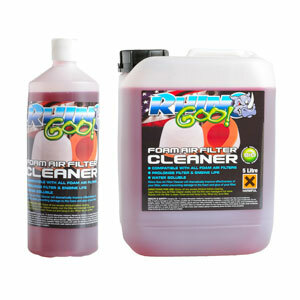 Simply mix 500 ml of the concentrated product with 5L of clean water to make up a highly effective cleaning solution that can be applied by hand or pressure washer. Any stubborn stains should be agitated with a soft brush or sponge and then rinsed off with clean water to finish. The solution dissolves black streaks caused by the degrading of window rubber seals and even cleans the seals themselves. Green algae is equally as easy to shift as black streaks and the cleaner contains an algae growth inhibitor to help keep your pride and joy looking new. The inhibitor also helps to increases the time periods between cleaning. 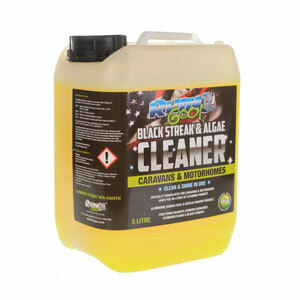 Rhino Goo Black Streak & Algae Cleaner is aluminium, rubber seal & acrylic window friendly.